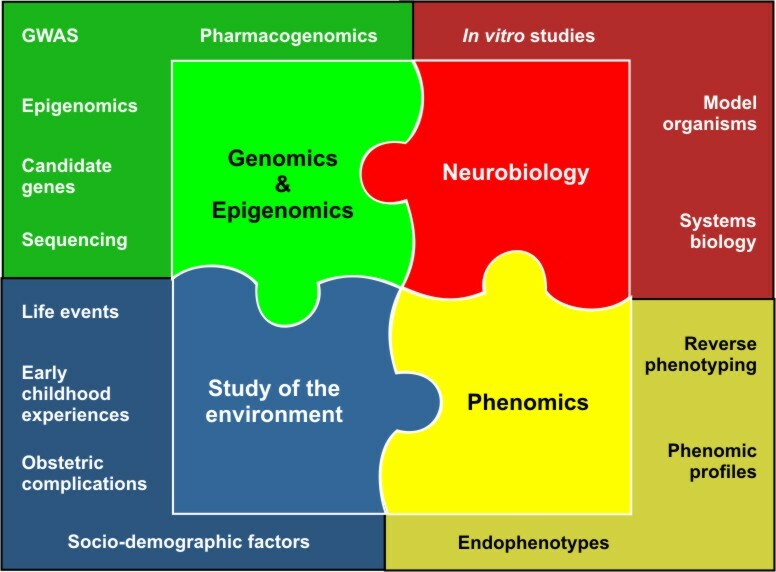 Network of joint basic and clinical strategies for unravelling the biological bases of psychiatric disorders. Research into the molecular biological basis of psychosis (schizophrenia and bipolar disorder) has reached an important point in time. Genome-wide association studies (GWAS) have been performed, encompassing several thousands of samples, which are analyzed jointly in meta- and megaanalyses. GWAS have identified several novel susceptibility genes for schizophrenia and bipolar disorder. However, variants so far identified account only for a fraction of disease liability. Thus, GWAS based on single nucleotide polymorphisms (SNPs) have to be embedded in a framework of complementary approaches, such as in-depth candidate gene studies, copy number variation (CNV) analyses, sequencing, gene-environment studies, pharmacogenetics, epigenomics, imaging, neurobiology, and innovative statistical modeling of genotype-phenotype relationships. One largely untraveled avenue so far is the study of longitudinal phenotypes. Until now, world-wide efforts have focused on cross-sectional samples of categorical clinical diagnoses of ICD-10 or DSM-IV-defined schizophrenia or bipolar disorder, although it is common clinical knowledge that patients differ widely in several aspects of the course of their illness. These include individual patterns of relapse, regain of functioning after an acute episode of illness, level of disability, cognitive functioning in relation to the duration of illness among others. This Clinical Research Group (CRG) focuses on an integrated research framework on the longitudinal course of psychosis. The CRG comprises both a clinical and a basic science component. In the clinical part, we perform GWAS (WP1/2 in collaboration with WP5), candidate gene studies (WP1/2 in collaboration with WP5), brain imaging and neurobiological studies (WP2), as well as pharmacogenetic approaches (WP3), using one of the largest samples ever established for such purpose, totalling 3,200 prospectively followed individuals suffering from psychosis (2,200 with SZ, 1,000 with BD). These studies are accompanied by studying a sample of 1,200 readily available healthy controls and a population-based sample of 3,000 controls, featuring an in-depth phenotype characterization overlapping with those of the cases. The clinical part is complemented by basic scientific projects involving animal models on epigenetic regulation (WP4) and the influence of environmental factors on potential susceptibility genes for the longitudinal course of psychosis (WP6).